While walking the show floor at PAX Prime last year, I spotted a booth set up by Cooler Master that looked more like a workshop than a demo booth. Indeed, they had set up a small maker space in the expo hall to show off their new case, the MasterCase 5. Wesley and I talked to Nathan Almond, the product manager for the master case and were very impressed with the very moddable, user friendly case he showed us. We resolved that our next PC would have to be housed in a MasterCase 5. I kept that promise with my new build and it has not disappointed at all. Right off the bat, I was surprised by the size of the case. For a mid size ATX case, it seems a lot larger than others I've seen. Functionally though, that only means there is more room inside for whatever bits and bobs I may decide to hook up. There is plenty of room for my 212 Evo CPU cooler, a beast of a cooler that can leave some cases eking out only the tiniest bit of room between the cooler and the side of the case. My GPU also has tons of clearance in the case. Extra legroom for my CPU cooler isn't what really sold me on the MasterCase, it was the ease of use and intuitive design of its components. There are so many smart design choices in the MasterCase 5 that it is exhausting to just list them all. Instead, I'll cover a few of my favorite bits and hopefully touch on a few of the others as I describe them. Modability is a big part of the MasterCase series. The top of the case can be swapped out for a taller cover that is meant to house more fans or a radiator in the event that I go for a liquid cooled system later on. making a dedicated space for a radiator is a big deal, as it frees up a ton of space in the rest of the case. After all, a cramped build is a trap for heat and the whole purpose of a liquid cooled build is to eliminate heat more efficiently. At the moment, I don't have any need for liquid cooling, but I am very appreciative of the option. I will likely pick up a couple fans to mount in that space, maybe with red LEDs to match the rest of the color scheme. Opening the case is really easy with the captive thumbscrews included in the case. The diameter of the hole the screws rest in is smaller than the diameter of the threads on the end of them. Unscrewing one from the back of the case doesn't remove it entirely, it leaves it dangling in the side panel, keeping me from loosing any during the build process. If you think that is cool, hold on. We're just getting started. When Nathan demonstrated the case to us, he said that everything in the case should be easy to install or remove with one hand. I tested this when installing my SSD and hard drive in the case. Aside from the standard 2.5" drive cage, there are two clip on enclosures for SSDs in the case that can be mounted either in the behind the motherboard or on top of the PSU partition. I opted to move mine behind the motherboard, as I figured the space just above the power supply would be a much hotter place to leave it. With one hand, I removed the screw from the enclosure, placed my SSD inside and affixed it to the back side of the motherboard tray. Later, when I needed to deal with SATA cable management, I was similarly able to remove the front hard drive cage with one hand. In fact, seemingly everything in the case is designed for tool-less installation. The easily sliding hard drive bays and the slide lock mechanism for the optical drive ports, the expansion bays, and even the power supply cage. You may not think of it as a really big deal, but any experienced builder can tell you that tool-less installation shaves a significant amount of time off of any build. Hell, even the edges of the trays were tweaked a bit. On many cases the edges of the motherboard tray are sharp little razor traps that exist only to draw your blood. but the MasterCase 5 has rolled all of those edges so there are no such blades present. throughout the build, the only cut I received was from the CPU cooler. The cable management options are an absolute life saver for someone like me. I get really frustrated trying to keep cables from poking out or tangling up or generally being in the way. The unsightly visual of a rat's nest of cables cris-crossing the motherboard is one thing, but poor cable management can also affect the cooling ability of the build or creates traps for dust to accumulate. 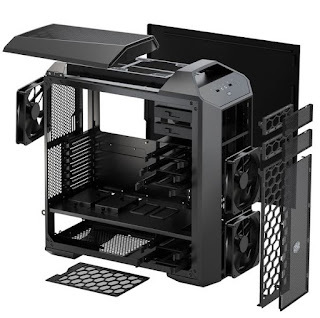 Again, the MasterCase has the situation well in hand with built in velcro cinches and a few channels for cables behind the motherboard, nicely out of sight. Any one of these features you could see just from looking at the case itself. My favorite feature was totally unnoticed until after I finished the build. The case remains unusually cool. I'm only running with the three included fans and the CPU cooler at the moment, but I am amazed by how cool the system remains. I can feel the cold air being drawn in through the front, the sides feel cool to the touch even while running Homeworld Remastered on high at 1440p for two hours. The PSU exhaust is a bit warmer, I was only able to tell the difference because the rest of the case was so cool. And should my cooling needs ever expand, the case supports up to six 140mm fans throughout the case. I'm so very happy about my purchase of the MasterCase 5. It made the process of assembling the PC much easier and discovering all of the nice little tweaks and options was a delight. 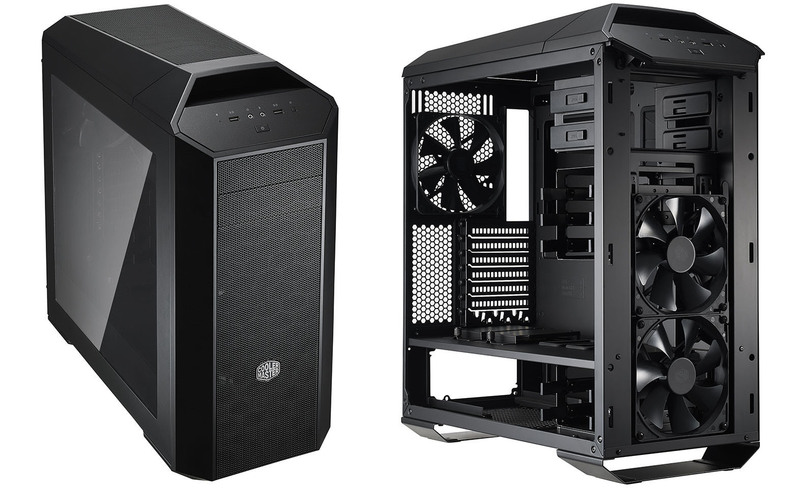 Even with its size, the MasterCase 5 is a beautiful thing to behold, and the innumerable interior options make it an easy choice when putting together any new PC.